“Communities should be empowered to bring forward their own local place plans, and these should form part of the development plan.” That was one of the recommendations of the Independent Review of the Scottish Planning System in May 2016 – recommendation 44, in fact. But what are ‘local place plans’? What would they look like? The closest thing we currently have in Scotland is, to my mind, the genre known as Community Action Plans. These are not statutory documents, like Local Development Plans or Community Plans (or Neighbourhood Plans south of the border). The distinguishing characteristic of Community Action Plans is that they are produced by local communities themselves, often with outside help from specialists. Being non-statutory, coverage is patchy across Scotland. I’m not sure anyone knows exactly how many there are. In some parts of the country, local authorities have supported communities to prepare Community Action Plans. Argyll and Bute, East Ayrshire, Loch Lomond and the Trossachs and South Ayrshire are good examples. In other places, communities have take the initiative: maybe because of a desire simply to improve their community, maybe because of the availability of community benefit funds from windfarms. One example of the latter is the Community Action Plan that I have just completed for Moffat and Beattock, with a team from WMUD, Icecream Architecture and 4-consulting. Having prepared a number of Community Action Plans in the past, this time we made a conscious decision to create a ‘local place plan’ as described by the Planning Review panel, including putting into practice the government’s agenda of better integrating Community Planning and spatial planning. Being a Community Action Plan, it was of course fundamental that the local community’s ideas and aspirations drove the Plan. 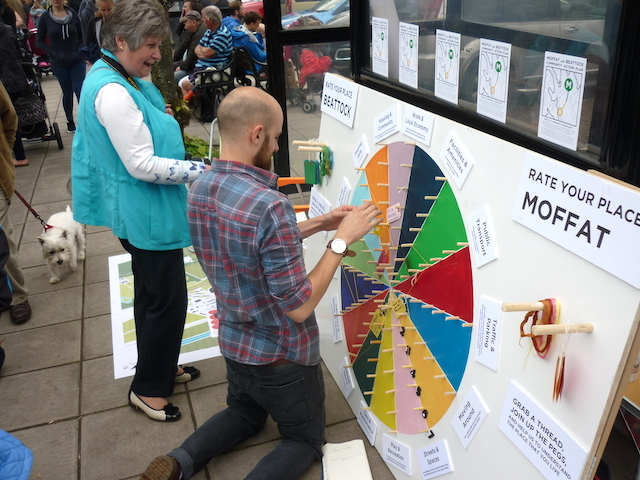 So there was plenty of engagement with the local community throughout the process, using the Place Standard and charrette-style engagement, in line with the recently updated National Standards for Community Engagement and PAS‘s SP=EED guide to effective community engagement in planning. But equally critical was the engagement with local authority departments and the Health and Social Care Partnership around how their future service delivery could reflect community aspirations. To my mind, a ‘local place plan’ can only be complete if it involves all the actors in making that place better. Although a new experience for many officers, most seemed to welcome it as a potential way of helping to make Community Planning work better for communities. Clearly there is a challenge for local authorities in resourcing this kind of activity, particularly those that cover a large number of communities, whether they be rural like Dumfries & Galloway or urban like Glasgow. If the Scottish Government’s forthcoming Planning White Paper, due this month, takes up the Planning Review’s suggestion of ‘local place plans’, it will be interesting to see how what it has to say about resourcing – not only for preparation of the plans, but for delivery of the proposals that they contain. But that’s a subject for another day. I’ve got one final message for anyone interested in ‘local place planning’. Preparing the plan document is, I believe, only part of the process. What’s just an important is helping the community and other stakeholders, like the local authority, build collaborative relationships to deliver what’s in the plan. Planners like me have a vital role in brokering those relationships, as I’ve explained in this recent blog post. That brokering role is, to my mind, critical for successful transition from plan to delivery. And a plan is worthless if it can’t be delivered.